Y Cofiadur ['the recorder'] is an annual Welsh-language religious history journal containing articles on the history of Welsh Independent churches and individuals involved, with references. It also includes society notes. 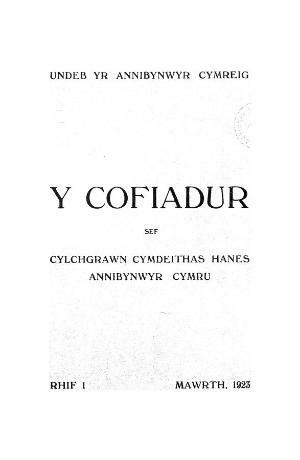 Publisher Details: Y Cofiadur is published by Cymdeithas Hanes Annibynwyr Cymru, a society founded in 1920 by Undeb yr Annibynwyr Cymreig.